“Dutch Reach” and Driver Exam Questions Law – The 2018 law requires the “Dutch Reach” method to be added to the state Rules of the Road publication. The law’s other addition to the Illinois Vehicle Code states “The Secretary of State shall include, in the question pool used for the written portion of the driver’s license examination, test questions concerning safe driving in the presence of bicycles, of which one may be concerning the Dutch Reach method.” We, along with our partner Active Transportation Alliance, were proud to advocate for the bill. The state is already implementing the changes. Ride Illinois and the Chicago Department of Transportation worked with the Secretary of State on updating the Illinois Rules of the Road manual, and Ride Illinois collaborated with the Secretary of State on test questions. Legalizing Biking on Shoulders, Cars Passing Bikes in No-Passing Zones and Rear Read Lights – A 2017 law officially legalizes biking on road shoulders, but does not require it, and allows a rear red light instead of, or in addition to, a rear red reflector. The most notable change in traffic law allows drivers to pass bicycles in a no-passing zone when: (1) the bicycle is traveling at a speed of less than half of the posted speed limit; (2) the driver is able to overtake and pass the bicycle without exceeding the posted speed limit; and (3) there is sufficient distance to the left of the center line. The driver must also pass with at least three feet clearance of the bicycle – a minimum distance mandated by a 2007 Ride Illinois-initiated state law. Ride Illinois proposed, negotiated, and lobbied for this law. IDOT Complete Streets – A 2007 law requiring IDOT to accommodate bikes and pedestrians in its roadwork, when warrants are met. Ride Illinois teamed with Active Transportation Alliance on a 2005 version, and then led discussions on policy implementation details after the successful 2007 bill. 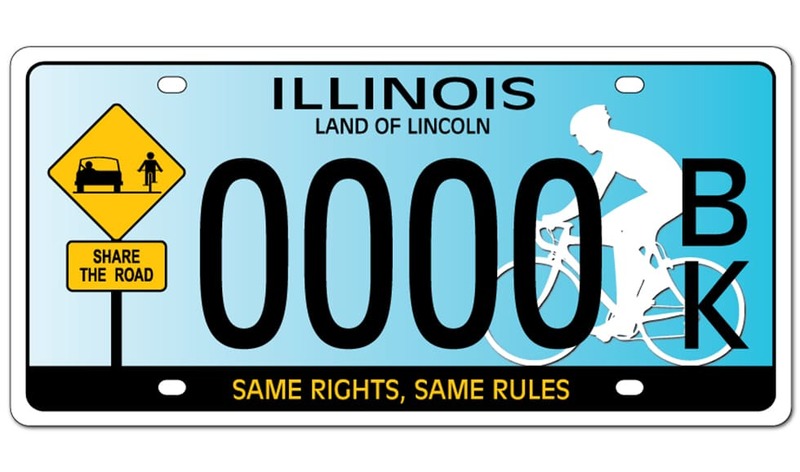 “Share the Road” license plate – Ride Illinois wrote and lobbied for the successful passage of the 2010 state law creating this specialty plate for cars, vans, and light trucks. Proceeds fund our programs to educate bike riders and motorists. Learn more and order yours here! “Share the Road” education resolution – Ride Illinois authored a 2010 House resolution urging local governments, state agencies, school physical education and driver education programs to educate motorists and bicyclists on sharing the road. On-road Bikeway Liability – The 1998 Illinois Supreme Court’s Boub v. Wayne Township decision left on-road bike riders without liability protection unless on a road specifically designated for bikes – thus creating a disincentive for local agencies to add bike lanes, bike route signage, etc. For years, Ride Illinois and Active Trans tried to find a solution suitable to legislators and powerful interests. Since then, Ride Illinois has provided information to calm local governments’ liability concerns. Many towns are moving forward with on-road bikeways.